David Kimche, in The Last Year of the World War. In 1917, the British Empire issued what became known as the Balfour Declaration, which stated that there was going to be a National Home for the Jewish people. At that time, England was the greatest empire in the whole world. 1917. Jerusalem’s occupants were desperate. Since the beginning of the Great War, three years earlier, they had been subjected to famine, epidemics and destruction. This period of starvation and deprivation under Turkish rule in the final days of Ottoman authority was now coming to an end. After 400 years of Ottoman rule, Jerusalem had passed into British hands. 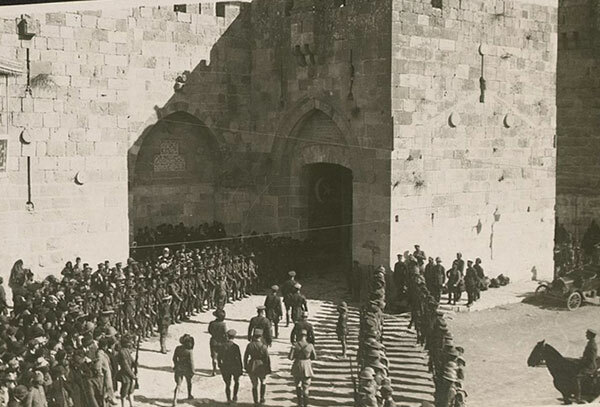 In the night of December 8, 1917, the Ottoman Turks abandoned the city of Jerusalem. December 9, 1917, he first day of Hanukkah and two weeks before Christmas, the British Imperial Army entered Jerusalem under the command of General Edmund Allenby. It was the beginning of a new chapter in the history of Jerusalem. On December 10, a formal announcement was made in the British parliament. Throughout Europe, church bells (Bells of Redemption) pealed in thanksgiving and special prayers were held in synagogues. In the eyes of Jews and Christians, Allenby’s entry into Jerusalem was a historic event. The Jews called it a “Hanukkah miracle” while the Christian world regard it as a “Christmas present”. and balconies lining Jaffa Road and people from different nationalities jostled for a good spot. General Allenby was accompanied by his staff (T. E. Lawrence ["Lawrence of Arabia"] among them), French and Italian officers, and various other international representatives. At the Jaffa gate he was greeted by an honour guard of Commonwealth and Allied troops; dismounting, he and his comrades entered the city on foot, as instructed. “Not a trumpet was sounded as the English army entered the Holy City. […] Hush! To avoid desecrating the sanctity of the Divine presence hovering over the Holy City. “ The Palestine News. Standing above the steps at the entrance to the Citadel of David, General Allenby was flanked by military officers and religious and civilian dignitaries. His proclamation, issued in several languages, was read out in English, Arabic, French and Italian. The Bezalel School of Arts and Crafts literally ‘beat swords into plowshares’ by embellishing used shell cases with different decorative motifs. Christmas cards and souvenirs were sent out from the Holy City. The British military administration took steps to establish new order and restore normal life. By imposing military administration (martial law, issues in seven languages) they also supplied food and water and began to collect taxes. 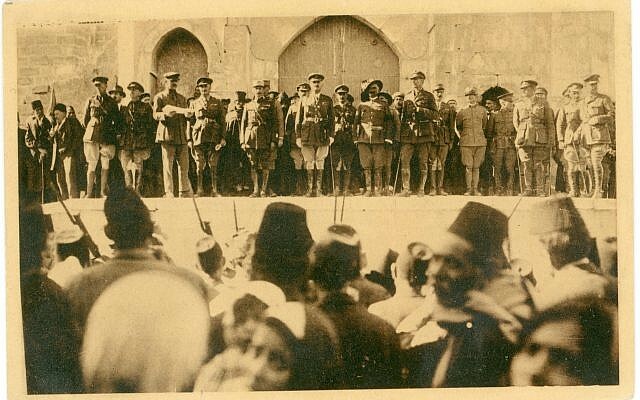 As the Turkish postal services had collapsed, the British offered free civilian postal services in Jerusalem. They also outlawed Turkish money and introduced British coinage. Conquest Babylonia – deliverance by the R.A.F. Exactly 100 years later, December 11, 2017, we had the privilege to witness the historic re-enactment of Allenby's entry into Jerusalem. 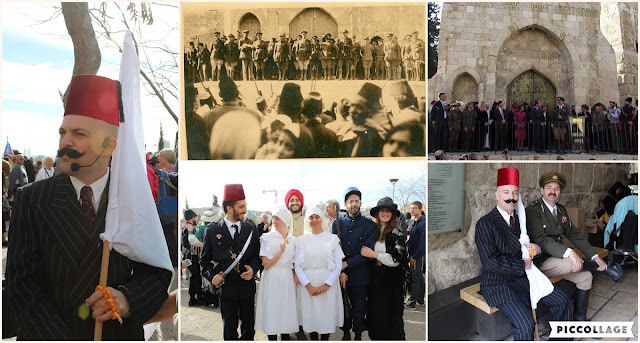 Actors mingled with the many tourists and Israelis, and family members of the people who had been part of this event in 1917, were also in attendance. 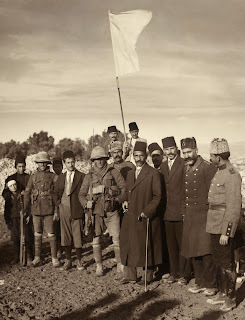 However, instead of continuing to be a blessing to the Jewish people, the British Empire opted to become a curse to them by issuing the “White Paper” and giving 77% of the promised territory to the Arabs. From 1948 onwards, the once powerful British Empire eventually lost everything.